100 Works of Art that will define our Age is a daring yet convincing analysis of which artworks best capture the zeitgeist of our time. 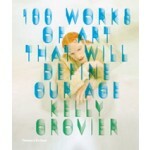 Kelly Grovier’s list also provides a much-needed map through the landscape of contemporary art. Bold and engaging predictions of which artists and artworks from the past two decades will endure through their power to question, provoke, and inspire. Just as Picasso’s Guernica or Gericault’s Raft of the Medusa survive as powerful cultural documents of their time, there will be works from our own era that will endure for generations to come. Kelly Grovier curates a compelling list of one hundred paintings, sculptures, drawings, installations, performances, and video pieces that have made the greatest impact from 1989 to the present. The global cast includes Marina Abramović , Matthew Barney, Christian Boltanski, Louise Bourgeois, Maurizio Cattelan, Marlene Dumas, Olafur Eliasson, Andreas Gursky, Cristina Iglesias, On Kawara, Jeff Koons, Ernesto Neto, Gerhard Richter, Pipilotti Rist, Kara Walker, and Ai Weiwei. Many of the pieces reflect the cultural upheavals of recent times, from the collapse of the Berlin Wall to the blossoming of the Arab Spring. Illustrations of key works are supplemented by comparative images, and short texts offer a biography of each artwork, tracing its inception and impact, and offering a view not only into the imagination of the artist but into the age in which we live.